New QUB head coach Mick Desmond got his first regatta season off to a strong start this past weekend at skibbereen regatta and at The Irish University championships on Inniscarra lake Co Cork . Saturday started with a win for Katie Keaney in Women’s Novice 1x and was quickly followed by a win for the Men’s beginner novice 8 for first year rowers. Queens continued to have strong performances throughout the day with both the men and women novices making finals and finishing 3rd behind some seasoned DUBC and UCD crews. Things were a little better in the novice 4’s with the novice women finishing 2nd and the men taking 5th and a close 2nd to DUB. In the women’s open 8 QUB ladies punched above their weight to finish 3rd in their first outing in the 8 this season. The women’s inters had a comfortable victory in the WI4+ while the men’s senior 4- also took a win. The day was rounded off with two more wins in the senior categories. The women’s senior 4- of Claire Mc Ilwaine, Emma Kerrigan, Alexandra Greene and club captian Hannah Lavery took first place, before the Men’s 8 (Ellen Thompson, Charles Cunningham, Peter Gillanders, Andrew Little, Mark Coalter, Matt McKibbin, Trevor McKnight, Tiernan Oliver and captian Damian Hannon) took the victory they had been looking for in the men’s senior 8. Overall QUB placed 3rd in the points table, which given QUB’s modest entry is a pleasing result. Congratulations go to Trinity who took the Wiley Cup and to Colaiste Iognaid of Galway who were overall Schools’ Regatta winners. 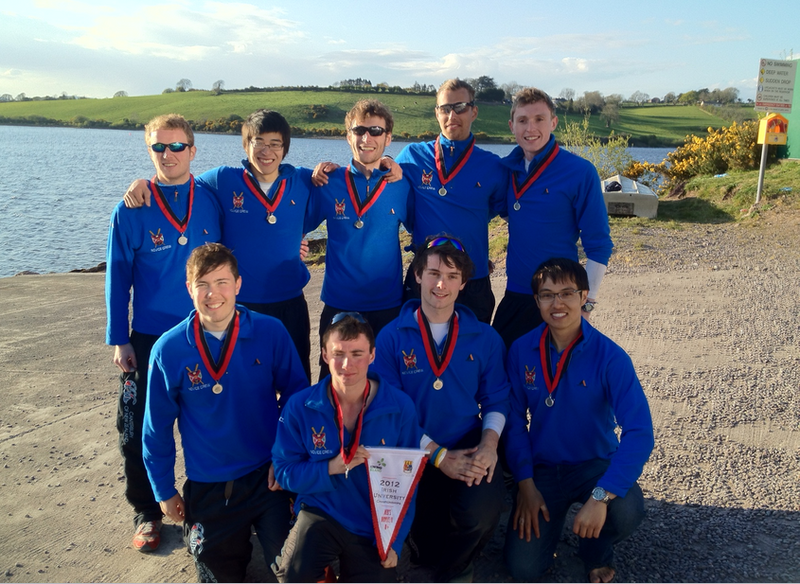 Queen’s further built on their successes of saturday by taking 8 first places at Skibbereen regatta on sunday. The men’s novices improved on their Saturday performances, by this time winning the novice 4+ and coming a close 2nd in the novice 8 against the same crews as the previous day. The 2nd Novice boat also finished well to win the B final. 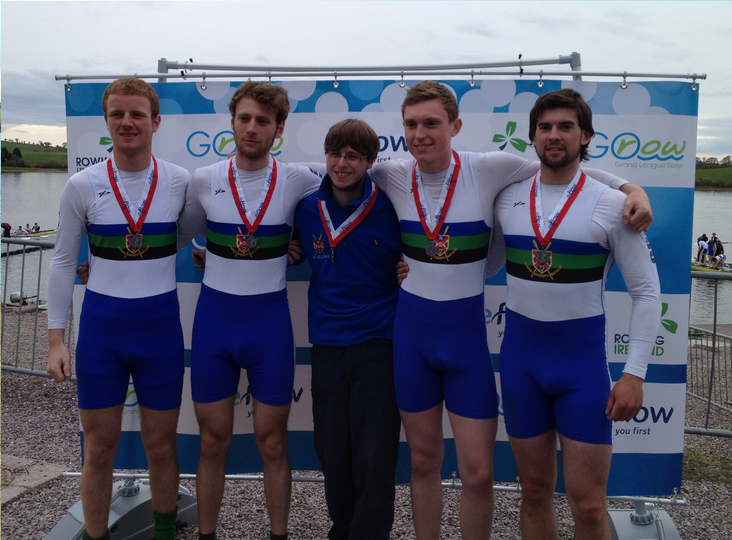 The men’s inter under 23 2x came away with the win. The senior women again took the S4- one length clear of the field. They also added W2- title to the win list. But the one that everyone had been waiting for was the last race of the day. The men’s S8, lined up against Galway’s Graínne Mhaol in the first show down of the season. Coming through 1000m DUBC, Graínne Mhaol and Queens were all in the hunt, but the race quickly turned into a battle between the Belfast and Galway men. The bows were neck and neck coming into the last 350m, but as the men raced for the line Queens pulled away to take the win by 2/3 of a length. The crews are unlikely to meet again until July where another close contest will be expected at the champs. Queens would like to commend the Skibbereen regatta committee on the smooth running of their event, the biggest ever held over one day in Ireland, which saw the race schedule running to time and the last race of the day starting at 6.30pm as planned. The next Grand League regatta will be our own Queens regatta on April 28 and we will be hoping to see another strong field take the water in Castlewellan. The club would like to thank all coaches and helpers that travelled with the athletes to cork over the weekend. Julie Lynch Women’s senior, Andy Wells Women’s Novices. Marc Butler, Paddy Doherty, and Steven Lockwood Men novices. Stuart Kelly men senior and Gavin Meek logistics officer.